The intimately scaled museum was designed by Robert A. M. Stern. 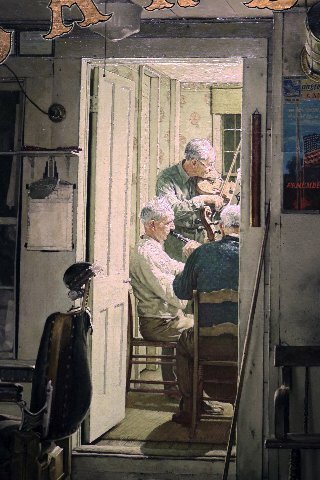 A Rockwell masterpiece "Shuffleton's Barber Shop." Courtesy of Lucas Museum. Compelling details evoke Dutch Masters. 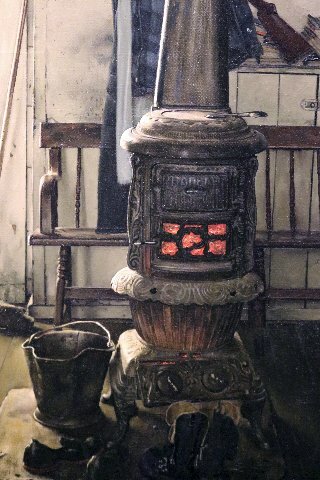 The glow of a stove and bucket of coal. An iconic Stockbridge panorama evoke paradigm of America's Home town. Courtesy of Rockwell Museum. Museum director Laurie Norton Moffatt. Giuliano photo. Looking forward to a busy season for the museum. Giuliano photo. The illustratior Dennis Nolan curated the scholarly exhibition. Giuliano photo. 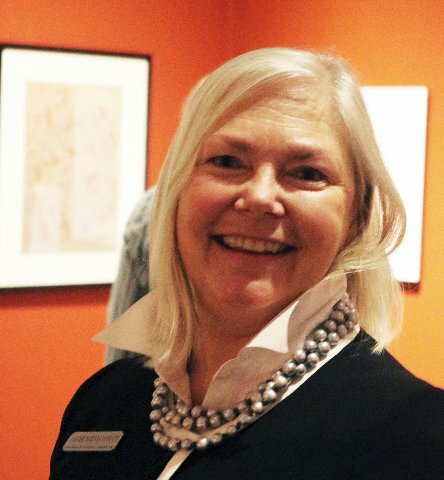 Initially, when director, Van Shields, and board president, Elizabeth McGraw, announced plans to sell 40 works to reboot the cash strapped Berkshire Museum and launch its “New Vision” there was enthusiasm from the community it served. With a soupcon of regret for the works to be lost there was unabashed cheerleading in a Berkshire Eagle editorial. 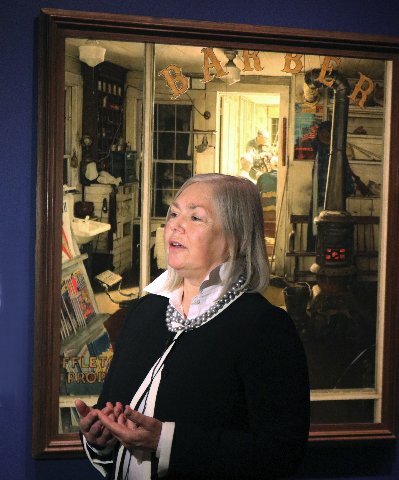 Among the first to speak out with a different opinion, followed by a year of protest and court challenges, was Laurie Norton Moffatt, the founding director of the Norman Rockwell Museum in Stockbridge. Of the 40 works to be sold were two by Rockwell “Shuffleton’s Barbershop” and “Shaftsbury Blacksmith Shop.” They were given by the artist to the museum on behalf of the people of the Berkshires. She argued on behalf of what the 40 works meant to the community particularly the two paintings by Rockwell. It represents a loss that no amount of money can ever compensate. The two Rockwell painting are now sold. They are gone forever from a community that richly appreciated them. There is, however, a bittersweet reprieve. 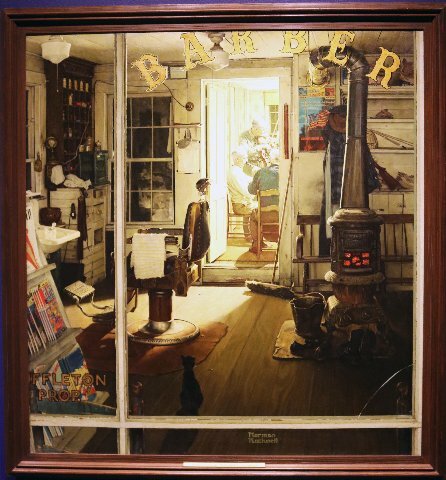 A true friend of Moffatt and the Rockwell Museum, filmmaker George Lucas, bought “Shuffleton’s Barbershop” in a private sale arranged through Sotheby’s. He is graciously lending the painting to the Rockwell Museum for 18 months. The Pennsylvania Academy of the Fine Arts acquired “Valley of Santa Isabel New Granada” by Frederic Edwin Church. The painting, which was valued at between $5 million and $7 million, failed to sell in a May 23 auction. It was acquired by PAFA via a private sale arranged by Sotheby’s. The museum is offering free admission to Berkshire residents with valid ID. 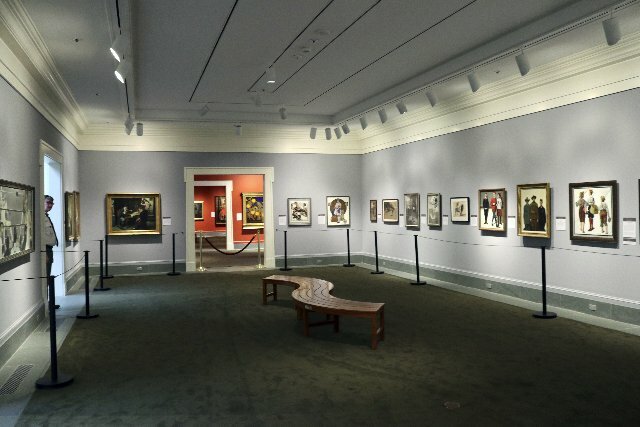 During a recent press opening for the summer exhibition “Keepers of the Flame: Parrish, Wyeth, Rockwell and the Narrative Tradition” we were able to look long and deep at a Rockwell masterpiece that has garnered global media attention. The special exhibition places it in context with the golden age of narrative painting in America. There is a thorough exploration of the continuous tradition of training that traces back to École nationale supérieure des beaux-arts de Paris and beyond to the studios of Italian Renaissance masters. The training involved in the profession of illustrator at Rockwell’s level took years of discipline, practice and mentoring. This scholarly exhibition, arguably the most compelling ever mounted by the museum, exquisitely conveys passing the torch from one master to another. By every definition this is a blockbuster exhibition likely to cause traffic jams in quaint, rural, bucolic Stockbridge. Largely through Rockwell’s numerous Saturday Evening Post illustrations and covers, including a meticulous panorama, Stockbridge has become the paradigm of America’s home town; particularly during holidays. There is a lot on view, not just to like, but truly to love with heart and soul. 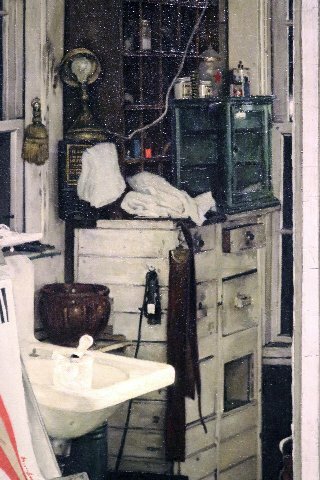 Charles Giuliano What does having Norman Rockwell’s masterpiece “Shuffeleton’s Barber Shop” (1950) here this summer mean to you and the museum? This is a masterpiece by Rockwell and truly one of his most beloved images. It will be accessible to the public and remain on loan at the Rockwell Museum for 18 months thanks to the generosity of the Lucas Museum of Narrative Art. The summer exhibition runs for five months (through October 28, 2018). The thesis of the exhibition is the narrative tradition and how artists learn from European teachers through the great tradition of American illustrators. “Shuffleton’s Barber Shop” is the exemplar of the Old Master tradition. It reflects the influence of the European tradition of Dutch Masters. We’re thrilled to have it on exhibit this summer and to be a part of a thesis that we’ve been working on for five years. CG So there’s serendipity that it became available. LNM That’s fair to say. There is serendipity that we were able to put this painting on exhibition through our longtime relationship with the Lucas Museum. Their director Don Bacigalupi has worked with us for some time. (He is founding president of the Lucas Museum of Narrative Art. He joined Crystal Bridges, in Bentonville, Arkansas as executive director in 2009 and developed the museum before its 2011 opening. He remains a member of Crystal Bridges' board. "Don's decades of experience include a proven track record for building a museum from inception," Lucas said... He regards the museum as a home for "orphaned" un-elitist art. We worked together when Don was director of the San Diego Museum of Art. 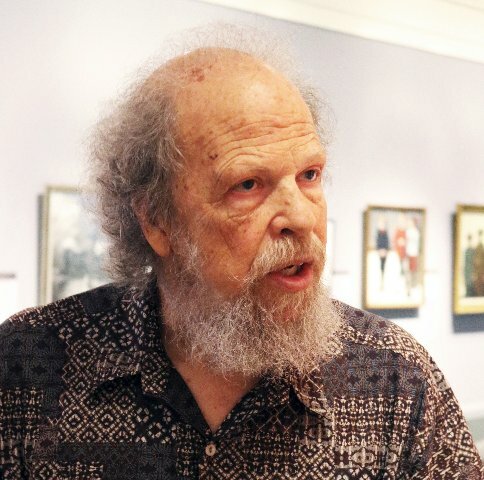 When he was at the Toledo Museum of Art we talked about an exhibition of Rockwell’s Old Master influences. That was an earlier concept of this exhibition. We worked with him at Crystal Bridges when our exhibition “American Chronicles” was displayed there (March 9 through May 27, 2013). We are so fortunate to have worked with him and the Lucas Museum which has been lending work to us for more than a decade. George Lucas has been funding our education and learning program, an investment in digital learning for students all across the country. The artist (Lucas), the museum, and its director Don Bacigalupi have been very close to us for a long time. We are grateful for their generosity and they were thrilled that it will be featured in this special exhibition. CG It has pride of place in the exhibition. LNM It does which is so fitting for that world. CG It holds its own in distinguished company. LNM We have Renaissance Old Masters here at the Rockwell Museum for the very first time. (Neri di Bicci “Triptych of the Madonna and Child with Saints” circa 1440.) There is a tradition as teachers of the narrative painters. LNM You can interact with the (digital) family tree and see how each artist relates with the next one. Leonardo da Vinci and Sandro Botticelli fit in here. CG Did you try to get those loans? (both laughed) What is the plan for “Shuffleton’s Barbershop” after the show ends in October? LNM There is a series of exhibitions that we plan arranged around the painting. They range from understanding the working process and other cameo exhibits around that painting. They will be smaller exhibits exploring aspects of the painting: Norman Rockwell the artist, the community he worked in, Vermont where he painted it, as well as the idea of community life. What’s the role of a barber shop or hair salon as a part of our life? It’s where everyone comes together and knows everything going on in each other’s life. There are a lot of fun ways that the picture will be interpreted. We have a number of educational programs planned around it as well. They will occur over the 18 months that we are glad to have the loan. CG Given the controversy, and resultant global exposure of this painting, how are you anticipating that it will impact attendance when it is on view in Stockbridge this summer? LNM I don’t like to project and speculate on attendance but what I can tell you is that there will be meaningful engagement around this painting. We have created a free family day for Berkshire County residents on June 10th. There will be other opportunities specifically focused on our Berkshire County community. Everybody in our community will have the opportunity to see and enjoy this magnificent painting. CG Do you have crowd control plans? CG What would be a top daily attendance? LNM It could be as many as 2,000 people during high season. We are adept at managing an overflow. If need be we would consider extended hours. We already have plans. If certain groups come we can open earlier. We have camps that come in the summer and school groups in the fall. They come in early. We have evening hours in the summer. There will be many ways to handle attendance. CG In the past year, because of the decision of the Berkshire Museum to sell its two Rockwell paintings, there has been enormous global attention and critical writing about the artist. As the museum that represents him how do you access the impact on his status, value and critical reputation? Is there an upside? LNM I want to clarify that you are not referencing the Norman Rockwell Museum. That has been the subject of tremendous national confusion. There has been a lot of confusion in the media even as nearby as Boston. I just want to make clear that our museum has not been involved in a controversy about Rockwell. 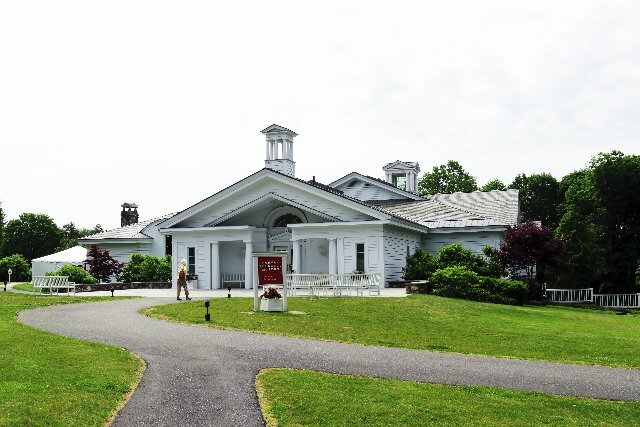 I want to make it clear that the Norman Rockwell Museum is not selling artwork. It is an assumption that many in the media have made. What I think we have seen is the tremendous affection the community has for him. Also, the preciousness of an artist’s gift to a community. Rockwell had already been receiving tremendous interest and acclaim in recent years. Part of that is the work that the museum has done and you see that reflected in the auction market. His work has set the record for non contemporary American artists. The public auction record for a Rockwell painting is $46 million. That was for his “Saying Grace” a grandmother and her grandson saying prayers. It was purchased by the Lucas Museum. I think we’re seeing a resurgence of affection that existed during his lifetime. The fine arts community had not considered Rockwell and the illustrators in the pantheon of American art. You have to take into account the millions of average citizens who always considered him to be their favorite artist. What we have now is all of the people who have loved his work as well as a broadening perspective toward narrative painting and realism. It is work that the art world is looking at and weaving together. From the perspective of the past fifty years we are seeing a renewed respect for narrative painting, realism, story telling, and subjective art work. The exhibition we did two summers ago on abstraction and realism looked at that. We see that the dichotomy between American illustration and American art is coming together. People are coming to realize that it is all a part of American painting. When people see the originals of Rockwell they see what a magnificent painter he was and the high quality of the work and how deeply moving, emotionally they are. They continue to resonate. CG This museum of one of the great success stories of the Berkshires. You took it from a thought in the mind of God to fruition. How long a journey has that been from then to now? LNM I am in my 32nd year as director. Before that I was senior curator and author of Rockwell’s Catalogue Raisonné. When I started here there are a couple of things I can tell you: how completely moved people were to see the work. The reasons the art world was not receptive to Rockwell’s world are twofold; the sentimentality of some of the works, and that they hadn’t seen originals. They had seen his work only in reproduction. It was so commercialized; there were so many collectables and few opportunities to see original works. Every time we have shown the work in exhibitions around the country, there have now been 150 museums, the work is always appreciated by those communities. What I saw when I started this museum is how deeply moved people were in their hearts. It was not uncommon to see people come in and cry when standing in front of one of the paintings. My thought was what is art for if it can move people so deeply? To have an experience with a painting that means something and resonates. The quality was always in the work and people hadn’t had the chance to see it. They had been taught to dismiss narrative painting because Abstract Expressionism was in vogue after the war. It was about trying to make sense of what had gone on in the world. That involved philosophers, authors, literary figures, and artists. CG There was the critical stigma of Social Realism/ Regionalism and narrative/ illustration was a part of that. Leftist art was vilified through McCarthyism. Dominant critics like Clement Greenberg and Harold Rosenberg promoted Abstract Expressionism, Action Painting, and the New York School. There was a shift from social justice narratives to formalism. The matrix of the avant-garde shifted from Paris to New York. Non objective art was embraced as apolitical during the Cold War era. LNM Right. You have the propaganda aspect of Social Realism and the war effort and Rockwell fit into that. So there was a turning away from that. CG Then Rockwell embraced Civil Rights. LNM If you get to NY in the next three months I hope you will see the exhibition there. His “Four Seasons” was an awakening to the power he had because he was a beloved artist. He could talk to people in a way that other artists couldn’t connect to. Rockwell was using a brush and the platform he had as an artist to change the world for the better. That’s what artists can do. They call our attention to issues that are important. President Roosevelt spoke the words of “Four Freedoms” but they didn’t resonate until the pictures they inspired. What do they mean to me and my family? They mean that I can put my children to bed safely. Coming to work this morning I was listening to NPR. I heard that children are unable to learn because they come to school from homes where parents are opiate addicted. Children are being taken away from immigrant parents. That’s about freedom from fear. LNM It costs a tremendous amount of money to move work worth half a billion dollars around the country and around the world. There are enormous expenses. CG Is the insurance covered by the Federal Government? LNM We did not succeed in applying for indemnity for this exhibition. The insurance is immensely expensive. With shipping and handling it can be up to a $1 million museum investment for this exhibition. It’s a major project that we have to raise money for. It’s about education and teaching a new generation. CG Anticipating that the museum will be maxed out this summer, a good thing, begs the question. Is the museum big enough? LNM I’m sure our curators dream of more gallery space. You may know that we are investigating expansion into the old (Stockbridge) Town Hall as our educational and research center. Conversations are going on with the town. It would open up program space and office space. It would allows us to have more programming space in this building (museum) by moving some functions to the other building. That entails a major fundraising campaign as well as lining up permissions. CG The galleries are relatively small and become cramped during days of maximum attendance. LNM These spaces were designed to human scale. They were designed by Robert A. M. Stern to reflect the hominess of our original building. The original space was half the size of this room (looking around a gallery). We have filled these galleries with changing special exhibitions. We show works by other illustrators as well as from the permanent collection. They are filled with our mission, programming and art. CG How many works are there in the collection and now many are by Rockwell? 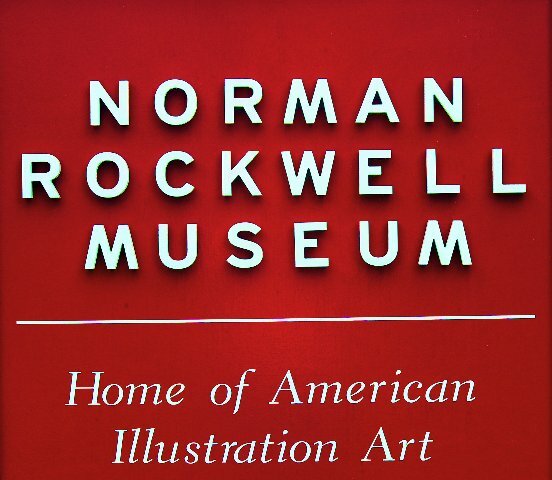 LNM The Rockwell collection includes over 800 works. Of his major finished paintings we have about 175. Then there are sketches and studies all by his hand. In addition to Rockwell we have 15,000 works all through gifts. CG Do you mean magazines and posters? LNM No all original works of art. CG Where do you keep them? LNM We have flat files as well as storage elsewhere in our community. We also have an extensive archive which is separate from the original works of art. That includes magazines, reference photography, textiles, letters and correspondence.